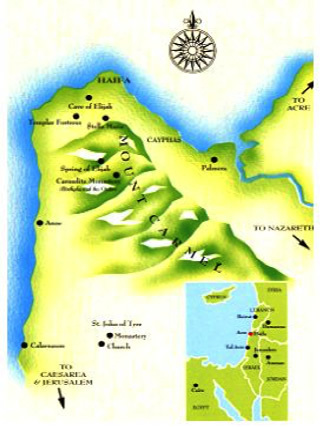 The Order of Carmelites has its origins on Mount Carmel, a coastal mountain range (Mountain of God) in Palestine near present day Haifa and overlooking the Mediterranean Sea. As we read in the 2nd Book of Kings, the great Old Testament prophet, St. Elijah, defended the true faith in the God of Israel, when he won the challenge against the priests of Baal. It was also on Mount Carmel that the same prophet, praying in solitude, saw the small cloud which brought life-giving rain after the long drought. From time immemorial, this mountain has been considered the lush garden of Palestine and symbol of fertility and beauty. Mt. Carmel’s name is derived from the Hebrew "Karem El" which means 'vineyards of God’, and in Hebrew CARMEL translates into the word GARDEN. It has always been considered a place of prayer and communion with God. The symbolism of the garden expresses not only the fertile richness of the natural terrain, but also refers to the grace and holiness bestowed upon the many souls who dedicated themselves to God on its mystical summit. 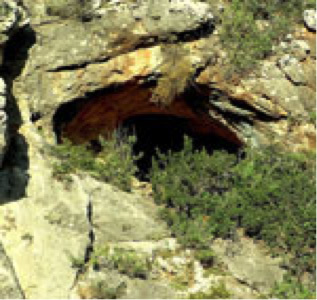 In the 13th century, some penitents-pilgrims who had come from Europe came together near the "spring of Elijah" in one of the narrow valleys of Mount Carmel to live out their Christianity as hermits after the example of the prophet Elijah in the very land of our Lord Jesus Christ. Then and in later times, the Carmelites did not acknowledge anyone in particular as their founder, but remained faithful followers of Elijah who was associated with Mount Carmel through biblical events and through Greek and Latin patristic tradition which saw in the prophet one of the founders of the monastic life. In the middle of the cells they built a chapel which they dedicated to Mary, Mother of Jesus, thus developing a sense of belonging to Our Lady as Mistress of the place and as Patroness, and they became known by her name as "Brothers of Saint Mary of Mount Carmel". Thus, the Carmel was born with a deep associated with Elijah and Mary. Standing always before the Living God on behalf of His people, and totally dedicated to His worship and glory, these hermits had heard the call of Jesus Christ to leave everything and to follow Him. They lived apart from others in order to deepen their conversions to Christ and to be transformed by a life of personal prayer in silence and solitude. They were pilgrims seeking purity of heart as contemplatives using the Prophet Elijah and Our Blessed Mother as models as they ruminated on Scripture and practiced hospitality to pilgrims. 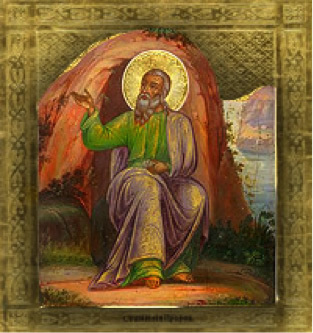 In order to have some juridical stability, the lay hermits turned to the Latin Patriarch of Jerusalem, St. Albert Avogadro (1150-1214), who was then living at St. John of Acre near Mount Carmel. Albert wrote a “formula of life” for them around 1209. This document became the Carmelite Rule. Around 1235 the Carmelites were forced to abandon their place of origin due to the incursions and persecutions of the Saracens who were re-conquering the Holy Land. Most of them went back to their country of origin in Europe. They soon increased and flourished in the sciences and in holiness. Successive approvals of the Rule by various Popes helped the process of transforming the group into a Religious Order, a fact which took place at the time of the definitive approval of the text as a Rule by Pope Innocent IV in 1247. The Pope strengthened their common life and encouraged them to accept a life of ministry alongside their lives of contemplative prayer. Thus the Carmelite Order took its place alongside the Mendicant Orders. In 1452 the prior general, Bl. John Soreth, was authorized to establish communities of woman and incorporate laypersons into Carmel. In the 15th and 16th centuries there was some relaxation of discipline in various communities and reforms were attempted to address various issues. The most famous reform was certainly the one started in Spain by St. Teresa of Jesus for the reform of the nuns and then, helped by St. John of the Cross and Fr. Girolamo Gracian, for the reform of the friars. In 1592 this reform, called that of the "Discalced Carmelites" or of the "Teresians", became independent from the Carmelite Order and grew rapidly in the congregations of Spain and Italy which were then united in 1875. Thus there are two branches of Carmelites: "The Carmelites", also known as of the "Ancient Observance" or "Calced", and "The Discalced Carmelites" or "Teresians" who consider St. Teresa of Jesus their reformer and foundress. In spite of this division, during the following centuries the Carmelite Order continued its spiritual journey. From Elijah, Carmelites inherited a burning passion for the living and true God and the desire to make His Word intimately their own in order to witness to Its presence in the world. His cry of triumph: "I have burned with zeal for the Lord God of hosts" has been adopted as the motto for the Carmelite Order. With Mary, the most Pure Mother of God, they are committed to live "in the footsteps of Jesus Christ" with the same intimate and deep feelings which were Mary's. She is the Mother and Patroness of all Carmelites and the scapular which they wear as part of their habit is a sign of their dedication to her and a reliance on her protection. They see in Mary one who, in her simplicity, was totally open and receptive to God's action and took her as their model and sister in their search for God. Biblically, Mt. Carmel is referenced most often as a symbol of beauty and fertility. To be given the "splendor of Carmel" was to be blessed indeed (Isa 35:2). Solomon praised his beloved: "your head crowns you like Mount Carmel" (Song 7:5).